Although materiality analysis is a dominant use case, Datamaran clients are increasingly using the platform for their Enterprise Risk Management (ERM). Similarly to the risk practitioners’ business processes, Datamaran enables an evidence-based approach to non-financial risk identification and management. This ensures a full alignment of risk management processes internally and a close collaboration between sustainability and risk teams. Those who assess and manage non-financial risks alongside other risks, use Datamaran 4 as part of the process of identifying, measuring, mitigating, monitoring and reporting non-financial risks following the stages outlined by The Committee of Sponsoring Organizations of the Treadway Commission (COSO). Those who are at an early stage of ESG integration, use Datamaran 4 for benchmarking against their peers or wider industries as well as research. As part of the risk management solution, users leverage the continuous issues monitoring function, receive personalized alerts, and access the full functionality of the Materiality Application, which includes Benchmark, Observe, Social, NewsFlow, and Comparison modules as well as the the Survey Function. "Datamaran allows efficient yet thorough gathering of evidence need for well-informed strategic decision making. The insights can be re-purposed for different projects across teams." ​​What is materiality? Which reporting framework – GRI or IIRC – is the correct framework to use? 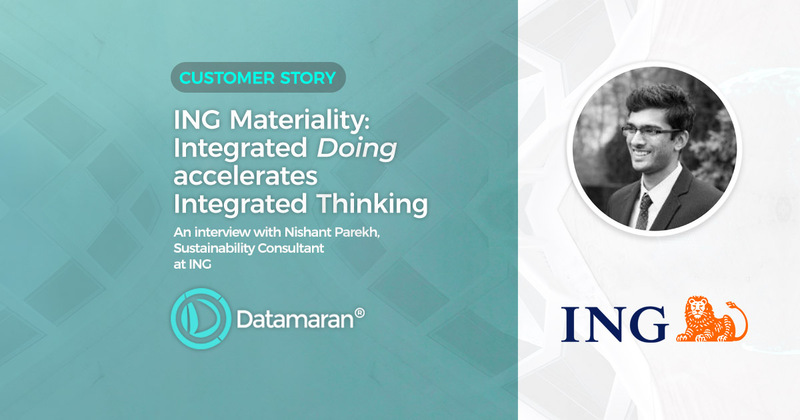 We spoke with Nishant Parekh, Sustainability Consultant at ING Group. "Datamaran helps us benchmark and analyze data on regulatory, competitive and reputational risks related to the latest economic, environment and social (ESG) issues." "We need reliable data-driven inputs and robust assessments of business critical information and insights into what is coming next. That is where Datamaran is an indispensable ally."